King Creole is possibly Elvis' best film, and certainly his best "dramatic musical". Directed by Michael Curtiz and Produced by Hal Wallis it reached #5 on Variety's National box office chart. The New York Times review noted that "Elvis can act" - praise indeed for the time. The Single reached #2 while both EPs went to Number 1 and Platinum status. UPDATE - See below for further details and possible corrections for this book. CD. The Music, 19 tracks 36 minutes. 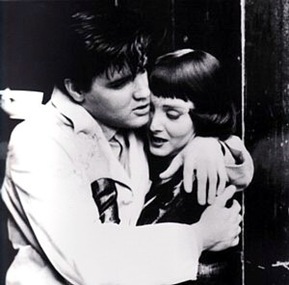 'King Creole' was Elvis’ 4th film. In December 1957 Elvis received his draft to the US Army but was granted a 60 day deferment so that he could finish his commitment to his new film. Originally from a Harold Robbin's novel called 'A Stone for Danny Fisher' two initial film titles were considered 'Danny' and 'Sing, You Sinners'. The director Michael Curtiz had previously received four Oscar nominations including Best Picture for directing Humphrey Bogart in 'Casablanca' - often nominated for the best film of all-time. King Creole Vol.1 EP – #1 - July 1958. 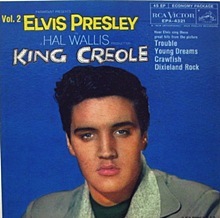 King Creole Vol.2 EP - #1 - August 1958. King Creole - LP - #2 August 1958. There is so much Elvis product still being released - and already on the market - that several key assets need to be considered when reviewing or purchasing anything new. With any Book/CD combination there are four things that I hope for. - Interesting new text, with the opportunity to learn something more about Elvis. - Interesting & high quality photos, hopefully containing some exciting unreleased images. - Quality music, hopefully with some unreleased collectable outtakes or suchlike, or if not a high-quality audio upgrade of previously released material. 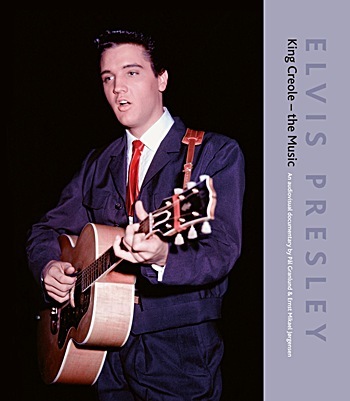 This ‘King Creole - The Music ’ FTD book/CD combo was released last July. With hardly any song outtakes available, it seems that FTD decided that this release could not work as a ‘Classic Soundtrack Album’ so instead have used plenty of unreleased new Elvis photos from the King Creole sessions (ex super-collector Pal Granlund) to create this deluxe book. The publicity notes, "Includes more than 200 classic, rare and never before published photos from the recording session and the filming of the song scenes for King Creole. The accompanying CD includes all known surviving Elvis recordings from the session". While it is described as an "Audiovisual documentary" sadly the CD only last 36 minutes including the 8 bonus tracks. So with no new session outtakes as a temptation and with a fairly high asking price (not that much less that the recent "The Elvis Files" which included 1,200 photos!) this package better be stunner. Using the same format as the other FTD books this is a similar size to ‘Flashback’ and ‘LIVE in L.A’ and sits nicely next to the others in my collection. While the book notes that the text is "Adapted from A Life In Music" it is in fact lifted word-for-word. There is some noted recording session data but otherwise the book has very little new details or exciting discoveries to read about. There are several factual errors that have annoyingly crept into the book (see comments below) perhaps the most glaring is the statement that Maxie Field's club is 'The Guilded Cage' whereas in the film it is most definitely called 'The Blue Shade'. The only other page of text in the book is one called "About the song scenes" which is embarrassing for its lack of description. In fact two songs ‘Young Dreams’ and ‘Lover Doll’ have no description at all, apart from their date of recording! The design is a fairly standard FTD layout but, as a positive, the book is printed on high-quality paper and as all FTD books has good binding. There are however a fair few of pages that unfortunately disappoint where the photographs would have benefited from being full-page, as opposed to half-size with huge white borders. There is no doubt that the selling point has to be the unpublished photos and a brand new chance to see an Elvis recording session in great detail - and to be honest there are some true gems here. Elvis appears very relaxed and in control and looking surprisingly not-stressed knowing that his time with Uncle Sam was looming close. Not to forget that Elvis looked so damn handsome during this period -somewhere between the Punk of 1956 and the ironed-out Army recruit of late 1958. 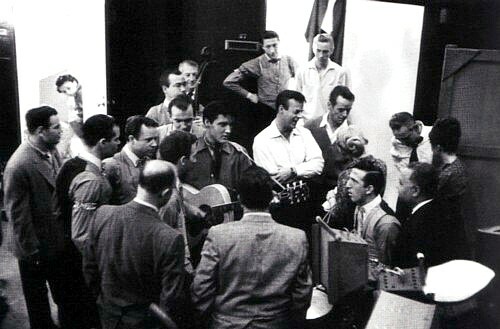 Seeing Elvis at work during recording sessions is a total TREAT – Elvis’ creation of great music is the key for me - and while there are a few session photographs that are familiar, there are plenty of others that are new. 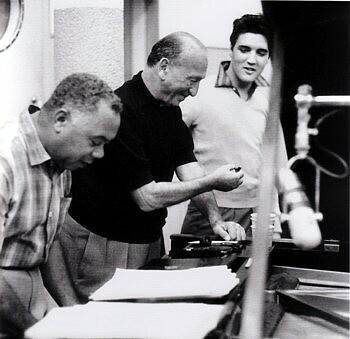 There are 92 pages of Elvis recording, playing the piano, talking with the band, Charles O’Curran and Hal Wallis etc. Some of them are truly fascinating. You can feel the music being created – it is almost a movie with plenty of images obviously taken seconds apart. 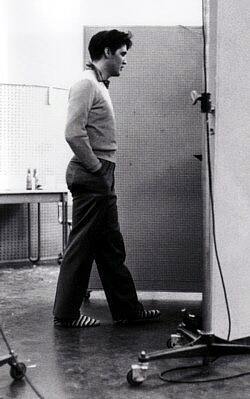 But that is perhaps another disappointment since all of the recording session photos are from the same day and within a very close time period (Elvis’ turned-up shirt collar never varies). However the images of Elvis concentrating at the piano and singing his heart out in his striped socks (see below) are absolute gems. The "Who’s who" index showing pictures of all musicians and arrangers is a nice idea. The second section of the book is "Song Scenes" from the movie and here the quality of the pictures vastly diminishes and several are very blurry. On a positive it’s nice to see Charles O’Curran rehearsing Elvis in the ‘Dixieland Rock’ shoot but again some more explanatory text would have been of interest. 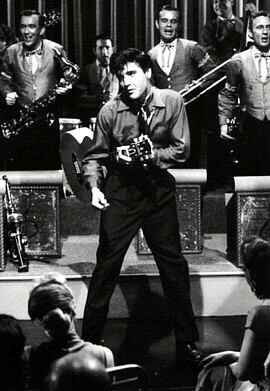 And once again one has to be stunned that Elvis’ performance of the single ‘Hard Headed Woman’ was filmed but then cut from the movie release! Other highlights are the photos from the filming of the original theme song 'Danny' which again was cut from the final print. (Are these photos the first genuine proof that 'Danny' was actually filmed?). 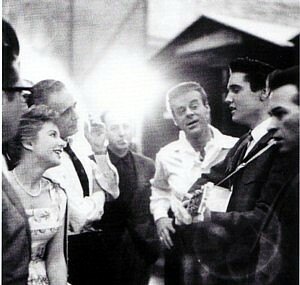 The Behind The Scenes sections are particularly effective many of them capturing Elvis not only enjoying himself on the movie set but also having fun with the cast and crew. However another disappointment is the lack of colour photos in the book, I was hoping for more from the King Creole cover photo session at the very least. Apart from the book cover - 3 pages of the regular film poster and singles covers - there is only one other colour photo in the book except from the well-known single publicity shot at the start. While the real positive has to be the Vic Anesini and Sebastian Jeansson audio upgrade on all the songs the disappointment has to be the lack of anything new. This is where the FTD ‘Flashback’ - a similar Audio-Visual documentary - was more engrossing since it covered a larger period, featured a good selection of colour photos, as well as some great unreleased music. As we all know the music itself is one of Elvis’ best soundtracks encapsulating the excitement of Elvis in the fifties but combined with the southern jazz-feel of New Orleans. The sound quality here is the best we have had, with a beautifully clear, yet warm, sound we expect from audio engineer Anesini. The top end is nice and shiny albeit with the expected slight increase in tape-hiss. The King Creole soundtrack features a great mix of music, the ballads are effective, ‘Dixieland Rock’ and ‘New Orleans’ (how fascinating that Tepper/Bennet ‘Ito Eats’/’Petunia’ etc contributed this gem) have a great jazz feel while ‘Hard Headed Woman’ was a real rocking single. Finally, the classic ‘Trouble’ a song that would come to define "leather Elvis" until the end of his career. The Bonus Songs are the same as featured on the expanded ‘King Creole’ BMG 1997 soundtrack CD with the one addition of the undubbed ‘Steadfast Loyal and True’. Here for the first time we also get some Take number announcements at the start. The real bonus treat for collectors is the extra 10 seconds at the start of ‘As Long As I Have You’ Take 8 where Elvis is mucking around and sings (just) one line "As Long As I" in a slurry Deano voice. It’s very cute. However with the CD running only 36 minutes I cannot fathom the reason for leaving out the extended 'Crawfish – full length version' (one of my favourites) as well as the instrumental 'King Creole - Main title' that were both previously released on Essential Elvis Vol.3. Overall Verdict: Of course it has to depend on one's desire for rare Elvis photos and your love of King Creole. Some of the FTD books ie. 'Writing For The King' and 'Rockin' Across Texas' are real gems with plenty to read, listen to and explore. While this "Audiovisual documentary" certainly has its merits, I would basically recommend this book/CD combo only to keen collectors and King Creole fans where it has to be a must for the quality printing and unreleased photos. After all if you like the look of our featured photo-scans in this review then, with 200 pages of similar photos, this book is for you. The problem for FTD is that without any new outtake material it would have been a little hard to present this in the "Classic soundtrack" format. However for the comparatively high cost (I see some dealers advertising it for over $120!) I feel that the average Elvis fan might expect more from the text and CD. FTD CD Credits: CD produced by Ernst Jorgensen. Mastered by Vic Anesini and Sebastian Jeansson. Further details and possible corrections for this book. Elvis fan Glen Johnson contributes this great additional information to our review.. I'm one of those keen "King Creole" fans you mentioned in the review above - and I would like to add a few extra points to the review that were missed out. Please don't credit me with this "King Creole" information, the real star of this show is 'Elvis: Frame By Frame' author Bill Bram. As you said, the new sound is wonderful, but after almost 53 years, I was astounded to hear reverb on Kitty White's 'Crawfish' vocals!!! As for the book, once again, thanks to that damned "Elvis A-Z" from 30 years ago, page 12 in the FTD King Creole book refers to "The Gilded Cage." In the movie Elvis walked past a building with that name (which was enough for the authors!) before going into the bar next door. The club's real name "The Blue Shade" is mentioned at least three times in the film! As for the so-called dates stated in the book that the songs were filmed, according to Bill Bram's film production notes, a lot of them are wrong. Several were supposedly filmed on Sundays, whereas Bram's notes state that production took place on only one Sunday and that was on location in New Orleans. Page 126: "Lover Doll" was filmed on Monday Jan. 27 & Tuesday Jan. 28. Page 130: "Young Dreams" was filmed on Fri. Jan 31. Page 146: "King Creole" was filmed on Wed. Feb. 5, (AND re-shot ?) page 180: Thurs. Feb. 13. So the pictures on page 152 would also be from Feb. 5. Page 154 "Don't Ask Me Why" was only filmed on Thursday Feb. 6. Page 164 Should say "As Long As I Have You" instead of "Don't Ask Me Why". Page 174 "As Long As I Have You" is incorrectly dated, it was actually filmed on Mon. Feb. 10. 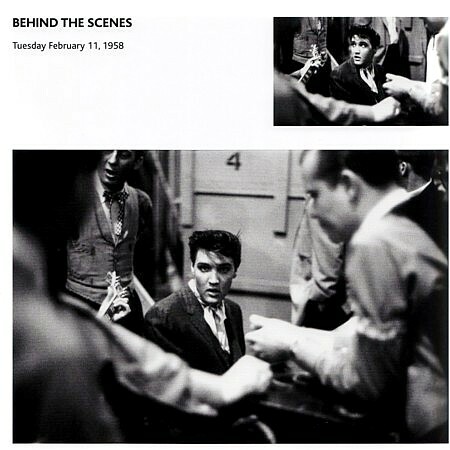 Page 178 As shown above in the review "Behind The scenes" shot with Elvis in the same clothes, should also state Feb. 10. Page 182 & 183: "Danny" was filmed Thursday Feb. 13. Page 184 "Trouble" was filmed Friday Feb. 14. Page 192 "Trouble" Behind The Scenes shots - also Feb. 14. When I asked about all these discrepancies I was told those were the dates on the back of the photos. Maybe so, but film companies are pretty scrupulous about accurate production schedules, so I tend to believe Bill Bram's notes.